On Thursday, April 5, Rowan University students and staff were invited into the Chamberlain Student Center’s reception hall, where experts in both science and communication sat on a panel for Art and Science Perspectives on Climate Change. 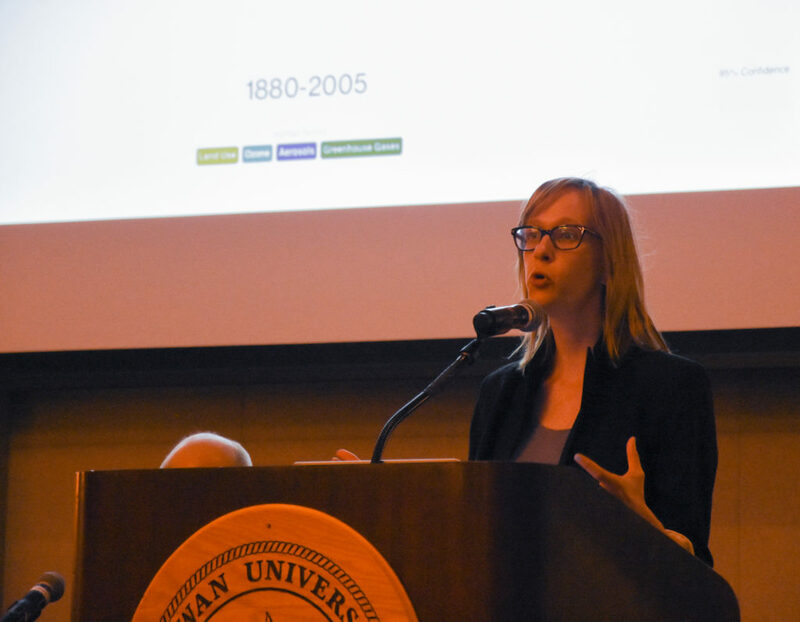 Hosted in partnership with the School of Earth and Environment and Rowan University Art Gallery, the event allowed keynote speaker Diane Burko (artist of “Vast and Vanishing,” the university art gallery’s most current installation) a moment to express the importance of using art to bridge the gap between science and emotion. “What I’ve been able to do the last decade or so is take the information that I get from scientists and translate it and then communicate it,” Burko said, who began her career as a landscape painter. She first became interested in climate change in 2006 following her coincidental participation in an exhibition of Icelandic volcanoes. Thus began her career relationship with geologists and other climate scientists, using common geological research methods such as repeat photography and recessional lines. Since then, she has been named an affiliate of The Institute of Alpine and Arctic Research, and been invited to speak at the Arctic Circle Assembly Conference in Reykjavik, Iceland. She has also engaged in the Scientists’ March on Washington, and identifies as a “subversive” on the topic of environmentalism. Among those who know the realities and science of climate change best is Dr. Luke Trusel, an assistant professor of geology at Rowan whose current research is funded by NASA. Trusel participated in a panel discussion following Burko’s keynote. 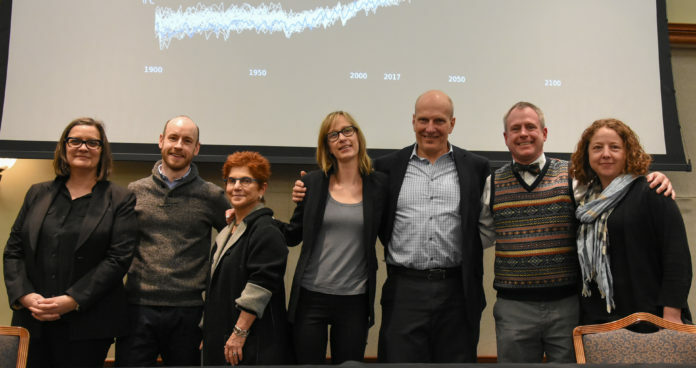 Perhaps the plight of climate education – and miseducation – in America was best summarized by panelist Dr. Kate Marvel, a research scientist at Columbia and the Goddard Institute of Space Studies. Marvel ended her talk by raising questions about the best way to relay climate change to a wider audience, suggesting a combination of science, art and writing. Diane Burko’s work is currently available for viewing at the Rowan University Art Gallery.